Some might disagree with me, but cats and dogs exhibit certain personality traits. Some cats are very friendly, some talk a lot, some always run away when they get the chance, some are aloof. Some dogs are friendly from the beginning, some are very shy, some like to bark nonstop. Most dogs are friendly, unless they have been traumatized by loud noises or mistreated. Gently turn down offers of cute puppies, breed unknown, in order to give yourself time to select one with the personality you want. Now please don’t send me nasty notes telling me that I’m a snob about breeds, and that mixed breed puppies are wonderful dogs with great personalities. I agree. Mixed breed dogs can be the greatest dogs around. I’m just giving you several things about dogs to think about. 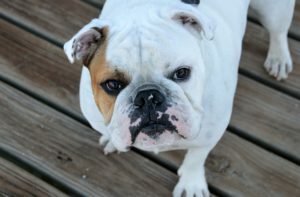 If you are adopting a dog for the family, especially a family with children, you might want to consider personality traits and compatibility before you bring the dog home. Remember, you will have that cute bundle of fur for about 10 or 12 years. There have been studies on what causes certain cats and dogs to exhibit certain traits. It seems that color and breed influences cat and dog personalities. If you know what kind of personality to expect with the pet of your choice, you will have a better idea of what to expect of your new family member. Today we concentrate on dogs. DNA studies of wolves and dogs point to a split into different species about 100,000 years ago. Domesticating dogs may have happened between 40,000 and 20,000 years ago. Researchers cannot agree, but some think that the domestication began in East Asia, others think it started in the Middle East, and others think there was a second domestication that took place in Europe. Whatever world circumstances were in place about 14,000 years ago that caused men and dogs to form working or companion relationships is still in place today. The bond between dog and human is unbreakable. One thing scholars do agree on is that most of the dog breeds we see today are recent developments. I picked several dogs that have quite different body builds that exhibit personality traits a family might be looking for. In dogs, breeds usually hold to one color or one color combination. In mixed breeds a variety of colors can be exhibited. 1. The Newfoundland–is a giant breed. It is usually black and has a natural ability to swim. It has a very placid personality and gets along well with children. If you love to swim, the Newfoundland is a perfect companion. Just remember, this lovable giant will eat a large hole in your grocery budget. 2. The Pug- -is a small dog- a member of the Toy group. 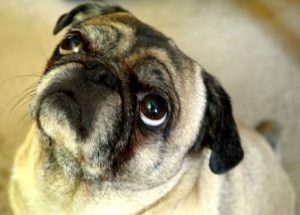 Pugs are very social and they can form a special bond with children. They also will be a little easier on your grocery bill. They can have light colored bodies with black faces. 3.Staffordshire Bull Terrier is a medium size dog and is a good companion dog for the family as long as he is the only dog. The Staffordshire is not good with other dogs. 4. Labrador Retriever- the most popular dog around today. Usually come in black, chocolate and light cream or tan. They make wonderful family dogs, but they must be trained. They also are large dogs. 5. 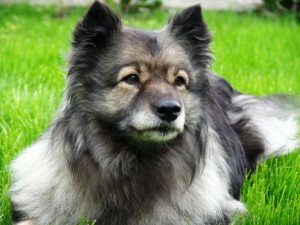 Keeshond- is a medium-sized dog with a fluffy silver and black coat They are great with children and easily learn tricks. These are truly people dogs. They are an old breed. They once were companions and watchdogs on the barges and boats that traveled the canals and rivers of 17th and 18th century Holland. 6. Golden Retriever- large dogs. They are extremely intelligent. The Golden is a great dog for a family. They always make good service dogs. By virtue of their name, their coats are golden brown. However, they can have light, off-white coats too. 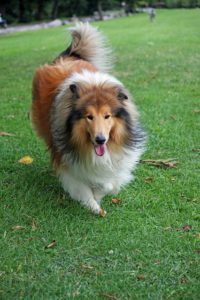 7.The Collie is a beautiful, gentle dog. A large dog with a gorgeous coat -light brown over all, and white on ruff, tummy and paws-who is well suited to families. 8. The Standard Poodle- A large dog that can come in several colors-black, white, gray. These are the wizards of the smart dogs. They are extremely intelligent and do well with all dog sports. Poodles are affectionate, patient, and make very good family dogs. 9. 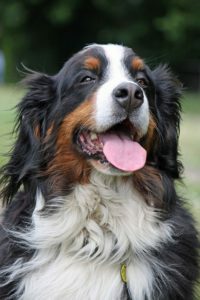 The Burmese Mountain Dog- another gentle giant. This dog can weigh between 98 and 120 lbs. when full-grown. They are good companions for children and they get along well with other pets in the family. The Burmese has a long shaggy brown, black and white coat. 10. The Bull Dog–a small dog that will become the clown in the family. They can be black and white, or light brown or tan and even white. They have a tendency to be stubborn, but they are also very docile and loyal, and do well with children. I named just ten dogs out of hundreds of breeds. Some are large, some medium and some small. I know I left out quite a few breeds that are also quite good at being family dogs. These ten breeds have certain personality traits that you can depend upon. Families with children need pets that the younger members can enjoy. Dogs and children grow up together and it’s a wonderful experience. Children also learn that pets are dependent upon their owners for food, exercise, and health needs. We often leave out the mixed breeds. Some of these dogs are wonderful with families and deserve a good home. If it is at all possible to find out the mix, it will give you a better idea of the personality traits you can expect. My mother adopted a Keeshond/Irish Setter mix and as the puppy developed into a mature dog, we could begin to see how the two breeds melded together into a beautiful friendly dog. Her body build was more like the Setter- a little larger with longer legs and a longer coat. But the Keeshond showed up in her coat color- the silver/ black with a thick mane. Her disposition was more like the Keeshond. 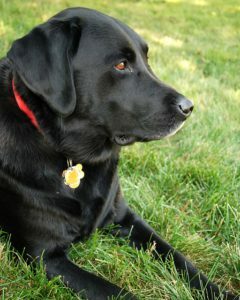 All in all, she was a wonderful dog, very loving and smart. Would love to hear from my readers. Let me know what you liked or didn’t like. Next time, we explore the personalities of cats by color. Information for this article came from : The Thought Co.; dogtime.com; Dog Reflections, May 2008 by Dan; Cattime.com; Pet Wellbeing; Pixabay .com. I totally agree that cats and dogs each have their own personalities. I have two cats. One is a bit black boy cat and he is playful and fun. He is into everything and just wants to lay. My girl cat is a tabby and all she wants to do is sit on someone’s lap and snuggle. They are very different but I love their uniqueness! I read all your article about dogs and oh my God I can’t wait to get the one for cats. The blog was very informative so many things i did not know about dogs. I do agree with the facts that mix raced dogs can really be a good companion and i am alwasy up for taking in any dog that needs a home. But please donot make me wait too long for the cats. I have three and I am really curious to see if their colour matches their personality. Thanks for the kind words. I’ll have the cat article out next week or sooner. Nice article! I personally have a German Shepard, she is a little crazy, haha. I think dogs are wonderful animals and an awesome addition to the family! They are great to have for so many reasons! What is your personal favourite breed/what breed of dog do you currently have? Thanks for the great article! My favorite dog breed is the Brittany. We had one when my son was growing up.She was a wonderful pet.Thanks for your comments. We have always had a dog in are family mainly cocker spaniels and they where always a fantastic family pet, but now we have a bull dog and yes he is a gentle dog but as daft as a brush and will forget his weight when playing with children. It is a beautiful history written about dogs. Many of the breeds have been described with important traits so one can pick and choose what they like. I don’t have dogs because I am scared of them. One of my neighbors has two dogs and they are a twin sister. Their breed is golden retrievers and they are so cute to look at. I wait for them just to see when they were taken to walk around the neighborhood. Talking to the ower I feel so happy because she described how happy her kids and family are to have them. Dog make families happy. They are faithful and full of confidence. I hope I could get rid of fears to own one of my own in future. I will come back to this post and website then. 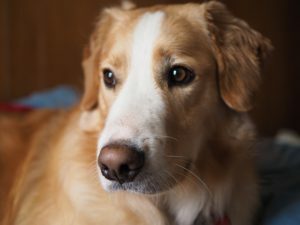 I find this post very helpful for me, I have not really gotten a pure breed for a dog and and I haven’t seen and don’t know how they behave, but with this post I believe I have enough guidance in knowing what breed would be better for you to purchase especially for my kids.